Maratek WEH models are wastewater purification units designed to recycle contaminated water from production processes. The WEH models use a heat pump for minimum energy consumption (average of 180 to 200 watts per litre of purified water). 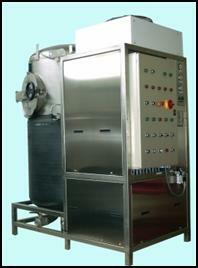 All units are equipped with an automatic fill system. Many techniques are available in order to recycle, re-use and minimize wastewater generated from production. Units are tailored to meet your requirements and integrate as seamlessly as possible into your production process. Contact us to discuss your specific needs or to obtain more details on equipment specifications.